Statistics & Facts about Hard Sodas in the U.S.
Hard soda, also referred to as flavored beer, is a sweet carbonated drink fortified with beer. It is a relatively new segment in the craft beer category. The drink is manufactured in the style of a carbonated soft drink and contains alcohol, soda and cane sugar. Hard sodas are available in a vast range of flavors, such as lemon, pineapple, orange, cherry, ginger, blackberry, raspberry, pomelo and cola. The hard soda market is booming in the U.S. It had its breakthrough in 2016 with sales amounting to about 146.9 billion U.S. dollars in that year, up from 1.98 billion U.S. dollars in 2015. The majority of hard soda dollar sales were generated through supermarket retail in 2016 and accounted for about 58 percent of all hard soda sales in the U.S.
Root beer was the largest category of hard sodas in the United States in 2016 based on sales amounting to about 126.73 million U.S. dollars that year. Root beer is a sweet brown carbonated drink flavored with juices made of root extracts, barks, and herbs that have been fermented with yeast and added sugar. Pineapple beer was ranked second in that year with sales of 14.47 million U.S. dollars. 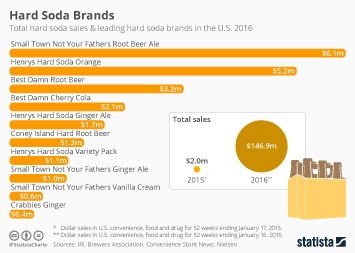 Within the hard soda segment, Small Town Not Your Father’s Root Beer Ale was the leading brand in the U.S. which generated sales of about 6.1 million U.S. dollars in 2016 and accounted for about 26.4 percent of U.S. hard soda market in that year. A recent survey conducted in 2016 among American alcohol consumers revealed, that about 28.8 percent of the respondents have purchased or consumed hard soda multiple times and about 10.9 percent of those asked regularly purchased hard soda.